When given the choice of watercolor vs. acrylic painting, everyone chooses to learn watercolor. In fact, I have to give the acrylic painting pep talk when I get inquiries about learning to paint. The truth is most people feel comfortable with watercolor because it is used everywhere. We are drawn to it’s pigments because they are happy and bright. We see watercolor images in card stores, on labels, illustrations, in animations and the list goes on forever. However, when we think of acrylic painting, our thought process changes. We think, “Oh, I am not an artist” or “That looks hard. I could never do that.” Want to know a secret? It’s actually just the opposite! Acrylic paint is very forgiving and perfect for learning. Therefore, it is a great medium to use when you begin painting. Acrylic dries fast and covers well because it is opaque. You work the paint from dark to light colors. When applying color over the top of any dry area of your painting, the true color will show on top of even the darkest color. If working while wet, the paint blends beautifully and mixes on canvas, without pre-mixing on your palette. Watercolor can be more challenging. With watercolor you can build up layers of colors while painting, but you work in a different order than you do with acrylic paint. Watercolor is translucent and unlike acrylic, you can not cover up your mistakes. If you want to preserve areas of light color, then you must plan ahead in your painting. In class, I teach little tricks of the trade on how you can preserve the white space on your paper and how you can delicately “fix” some overly saturated areas of color. Watercolor is a patient process. It is a dance of learning the right amount of water to pigment and applying it on a absorbent paper. The key is timing, and it’s comes with experience and a lot of painting. You can work with watercolors as wet on wet or wet on dry. 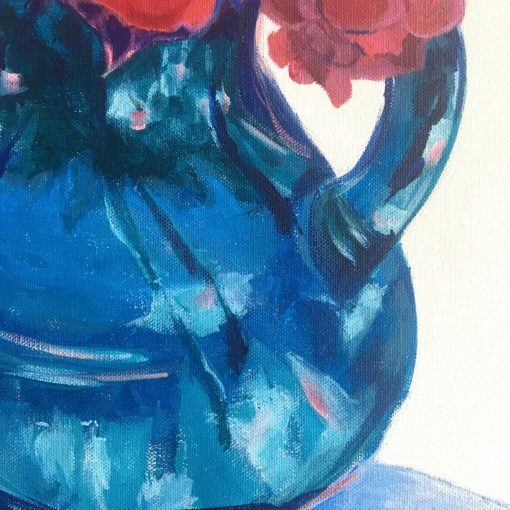 Once you learn the balance of how much water to use, it will completely take your painting to a higher level, and allow you to establish real color. I recommend learning acrylic painting first and discovering some of the principles in painting that will help you in learning watercolor. 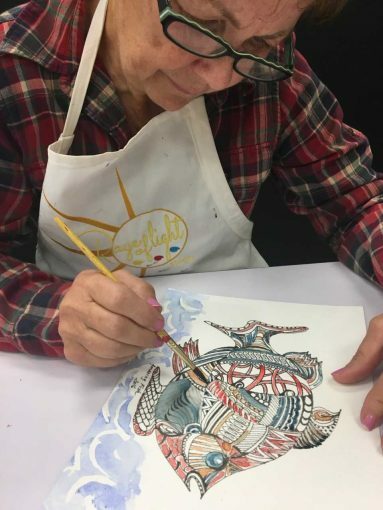 Watercolor is the older wiser sister to acrylic when it comes to painting. I definitely like to see people take a few acrylic painting classes, and then move into a comfortable relationship with watercolor. With the Spring and Summer months approaching, you may want to take your painting outdoors. If that is the case, then watercolor is definitely the perfect medium. Watercolor is the minimalist medium, because you just need your travel set of colors, one full brush that comes to a very narrow point, a great 140lb bond watercolor paper, and a spray bottle of water. 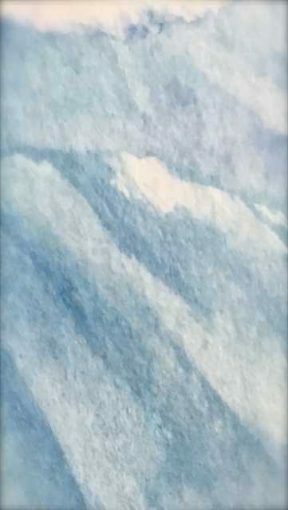 If you are painting with watercolors outside and your paint dries, you can just dip your sable brush into the water and rewet the paint or paper. 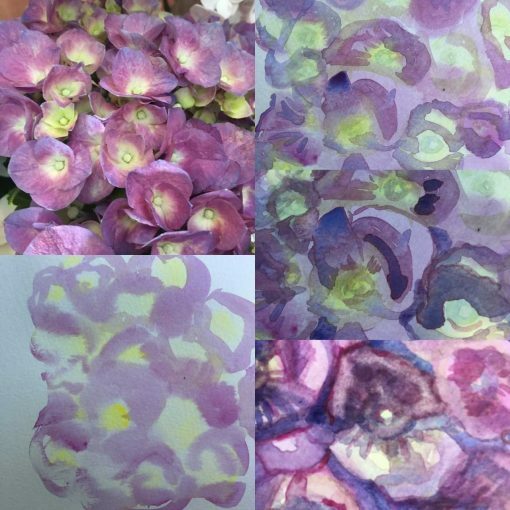 You can even revive dried watercolor paint by adding water, depending on what pigments you use. Acrylic painting outdoors can be more challenging. Acrylic paint is actually a type of plastic and the sun and temperatures tend to make it dry faster. Paint can even dry on your brush before you ever reach the canvas. And, unlike watercolor, adding water does not make more acrylic paint. April and May bring beautiful flowers and it’s a great time to learn how to paint those pretty blooms. If you are ready, you can take a class anytime! Just schedule day and time, or check out the April calendar and join us in a small group setting.